Cut your risks of heart attack and stroke with bouts of continuous aerobic exercise. Science shows that the benefits of aerobic exercise also extend to multiple other physical and emotional areas of our health. Get your heart pumping and enjoy the benefits of aerobic exercise. 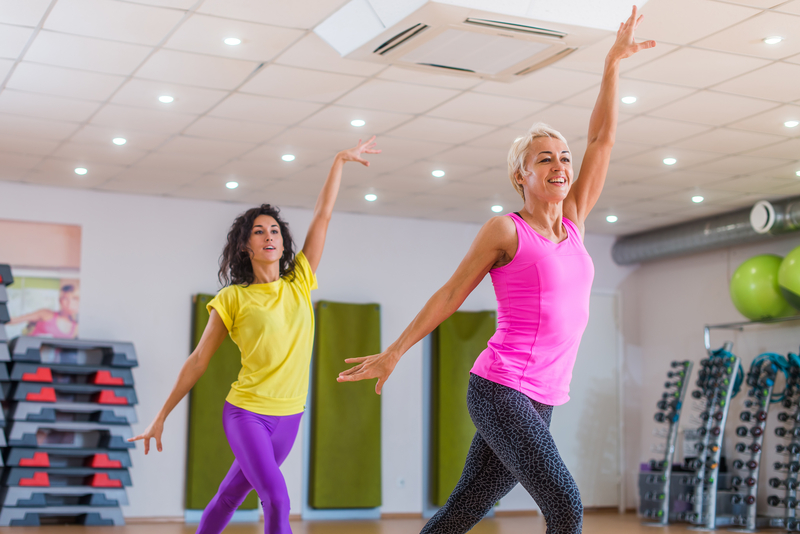 A dance class is just one of a wide variety of options for aerobic exercise. Aerobic exercise is continuous physical activity using large muscle groups for a sustained period of time (a minimum of 10 minutes). “Aerobic” means “requiring oxygen,” and aerobic exercise increases your body’s oxygen demand and your heart rate. “When performing aerobic exercise, you will feel your breathing speed up, your heart rate increase, and your body temperature rise,” says Pamela Geisel, MS, CSCS, a performance specialist at the Tisch Sports Performance Center at the Weill Cornell-affiliated Hospital for Special Surgery (HSS). Choose an activity you enjoy; if you find an activity boring or unpleasant, you’re not likely to stick with it. Set aside a regular exercise time. Get an “exercise buddy”—someone who will exercise with you and help you stay motivated. Outdoor exercise may be more fun, but bad weather doesn’t need to slow you down. Add a step box, agility ladder, or battle ropes to your arsenal of indoor cardio workout aids, per this TOPS.org post. During aerobic activities, Geisel explains, your body’s demand for oxygen increases, resulting in an increase in your heart rate in an attempt to meet the oxygen requirement. This increases the blood circulation throughout your body and results in a higher volume of blood being returned to your heart. This extra “load” causes adaptations in your cardiovascular system that are beneficial for your overall heart health. These benefits include a stronger heart muscle, lower blood pressure, lower resting heart rate, improved cholesterol levels (a decrease in LDL and an increase in HDL), improved blood flow, and a decreased risk for cardiovascular disease. Along with cardiovascular help, aerobic exercise enhances the function of your respiratory system, since it improves lung capacity. It also has been shown to improve weight management, insulin sensitivity, and bone health. Furthermore, aerobic exercise is an effective way to decrease stress and anxiety. You don’t have to exercise to the point of exhaustion to achieve the benefits of aerobic exercise. On the other hand, a leisurely stroll around the block won’t boost your heart rate enough to gain aerobic benefits. Check your heart rate. Moderate intensity is considered 50 to 70 percent of your heart rate maximum. Vigorous intensity is considered 70 to 85 percent of your heart rate maximum. You can calculate your heart rate maximum by subtracting your age from 220;. For example, if you’re 60, your heart rate maximum is 160 (220 minus 60). “Just keep in mind that your heart rate zones can differ based upon genetics, environment, fitness level, and other factors. I recommend seeing a fitness professional to help tailor some specific heart rate zones for you,” advises Geisel. Use the Rating of Perceived Exertion (RPE). The Borg RPE scale is a tool that measures your intensity on a scale of 1 to 10, 1 feeling like you are lying in bed and 10 feeling like you are sprinting from a bear. Moderate intensity is often considered a 4-6, and vigorous intensity is often considered 7-9.
a healthy heart, add, aerobic exercise, anxiety, blood pressure, bone, bone health, cardiovascular, cardiovascular disease, cardiovascular fitness, cardiovascular health, cardiovascular system, cholesterol, cholesterol levels, depression, exercise, fitness, get motivated to exercise, good health, hdl, health, heart health, heart muscle, how to get motivated to exercise, insulin, lack of motivation, ldl, lower blood pressure, motivated to exercise, muscle, perceived exertion, physical activity, sedentary lifestyle, stress, stress and anxiety, weather, weight management.